Fellow coast-to-coast Svengoolie SvenPals will be looking forward to the big broadcast return of a classic Columbia Pictures sci-fi stop-motion creature adventure. The legendary Berwyn/Chicago-based sci-fi/creature feature film host will present his big coast-to-coast broadcast encore of “20 Million Miles to Earth” (1957), this Sat., Dec. 1 at 8 p.m. Eastern/7 p.m. Central on Me-TV. The Ymir creature sequences were crafted by veteran stop-motion “Dynamation-Dynarama” visual effects pioneer Ray Harryhausen. 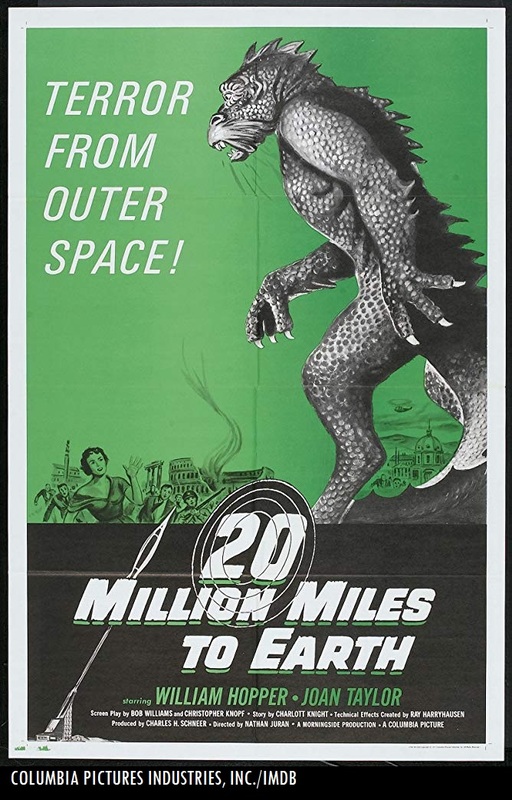 “20 Million Miles to Earth” (1957) was produced by longtime Harryhausen feature producer Charles H. Schneer. This was Harryhausen’s last black-and-white feature production before exclusively working on color “Dynamation/Dynarama” fantasy productions, according to IMDB. The 1957 Columbia sci-fi creature feature was directed by veteran film director Nathan H. Juran. During that same year, he directed the Universal sci-fi creature feature; “The Deadly Mantis” (1957). Adapted from Charlotte “Charlott” Knight‘s story, the screenplay for “20 Million Miles to Earth” (1957) was written by Christopher Knopf and Robert Creighton Williams. This will mark Sven’s second coast-to-coast big broadcast presentation of “20 Million Miles to Earth” (1957) on Me-TV. He previously premiered the 1957 Columbia/Harryhausen sci-fi classic from coast-to-coast in May 2018. A decade earlier, Sven showcased “20 Million Miles to Earth” (1957) on his hometown TV station in Chicago/Berwyn, WCIU-TV/”The U” in Sept. 2008 (according to IMDB). Who was in the Juran-Harryhausen Columbia sci-fi creature advenuture? The players who appeared in “20 Million Miles to Earth” (1957) were William Hopper (as Col. Robert Calder; Hopper went on to greater fame in the role of Paul Drake in the 1957-66 CBS TV adaptation of Erle Stanley Gardner’s “Perry Mason” with Raymond Burr and Barbara Hale; Hopper also appeared in “The Deadly Mantis”), Joan Taylor (as Marisa Leonardo; Taylor appeared in a previous Harryhausen/Columbia sci-fi feature, “Earth vs. the Flying Saucers” in 1956), John Zaremba (as Dr. Judson Uhl), Tom Browne Henry (as Maj. Gen. A.D. McIntosh), Frank Puglia (as Dr. Leonardo), young Bart Braverman (as Pepe, credited under the name of Bart Bradley feature; Braverman later appeared in Aaron Spelling’s “Vega$” with Robert Urich from 1978-81), Jan Arvan (as government official Signore Contino), Tito Vuolo (as Commissario Unte), Arthur Space (as Dr. Sharman), an uncredited cameo appearance by Ray Harryhausen (as a spectator feeding an elephant) and William Woodson (in an uncredited role for his introductory narration). Whether you watched the parade earlier today or watching your favorite classic film or TV series, watching classic MST3K on Shout! Factory TV’s platform, the Netflix rendition of “Mystery Science Theater 3000” (and today’s season 12 premiere of “MST3K: The Gauntlet”), the Pee-Wee Herman (“Pee Wee’s Playhouse”) Thanksgiving marathon over on IFC, the “Turkeys Away” episode of “WKRP in Cincinnati” this evening on Me-TV or gearing up for Svengoolie’s big broadcast of William Castle’s “Mr. Sardonicus” (1961) this Sat. on Me-TV; we hope you’re all having a happy Thanksgiving! I am thankful for all my fellow SvenPals, MSTies and classic/cult film and TV aficionados/readers everywhere! Peace and “Hi-Keeba” to all! -C.H. Fellow Svengoolie SvenPals everywhere will be excited about the big broadcast return of a classic Columbia Pictures thriller from one of cinema’s macabre masters. Columbia Pictures publicity pressbook art for William Castle‘s “Mr. Sardonicus” (1961). The legendary Berwyn/Chicago-based thriller film host will showcase “Mr. Sardonicus” (1961), this Sat., Nov. 24 at 8 p.m. Eastern/7 p.m. Central on Me-TV. “Mr. 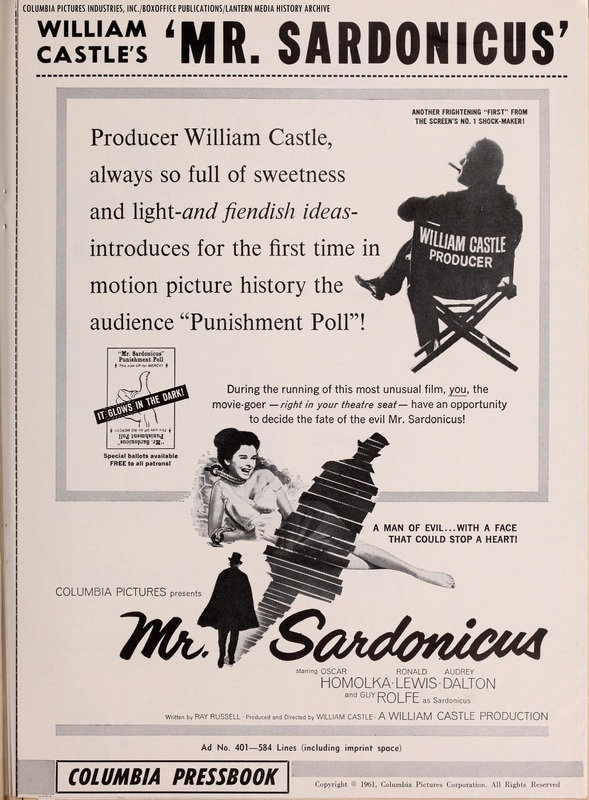 Sardonicus” (1961) was directed by legendary veteran thriller-horror film director William Castle, known for “Macabre” (1958), “House on Haunted Hill” (1959, w/ Vincent Price), “The Tingler” (1959, w/ Price), “13 Ghosts” (1960, w/ Charles Herbert) and “Homicidal” (1961, with Glenn Corbett). Years before he worked on his trademark macabre gimmick thrillers, Castle directed several features in Columbia’s “The Whistler” mystery film franchise series with Richard Dix in the title role (in 1944, 1945 and 1946). He also directed several of the studio’s “Crime Doctor” mystery film series with Warner Baxter in the title role (in 1943, 1945, 1946 and 1947). Castle also served as an associate producer on Orson Welles’ Columbia film noir/crime drama with Rita Hayworth; “The Lady from Shanghai” (1947). This will mark Sven’s second coast-to-coast big broadcast of William Castle’s 1961 Columbia macabre thriller classic on Me-TV. He previously aired “Mr. Sardonicus” (1961) back in April 2018. According to IMDB, Sven previously showcased “Mr. Sardonicus” (1961) a decade earlier on his hometown station in Chicago/Berwyn; WCIU-TV/”The U” in Nov. 2008.
Who was in William Castle’s “Mr. Sardonicus” (1961)? 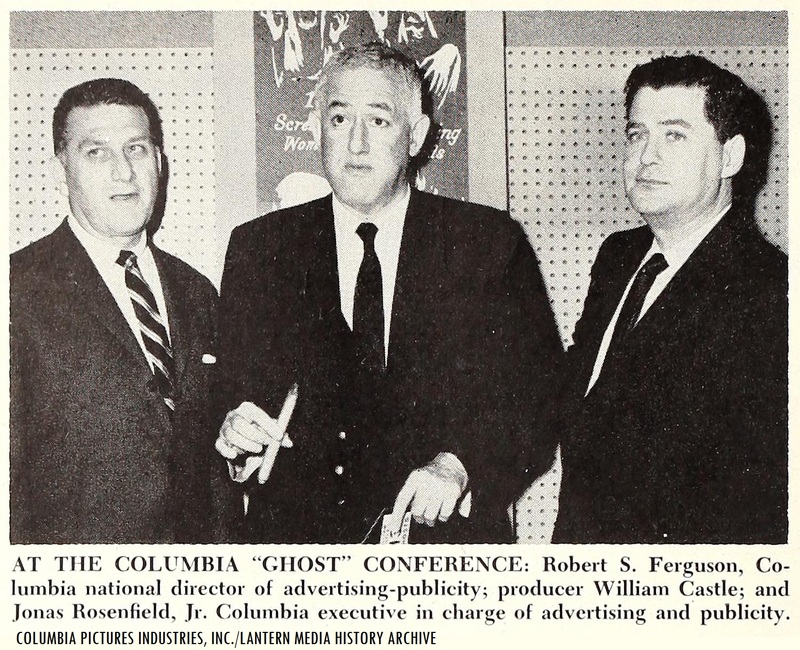 William Castle, with Columbia Pictures advertising/publicity heads Robert S. Ferguson and Jonas Rosenfield Jr. (originally taken for “13 Ghosts” in 1960). The players who appeared in “Mr. Sardonicus” (1961) were Oscar Homolka (as Krull; Homolka previously appeared in the role of Blackie in third Universal “Invisible Man” production, “The Invisible Woman” in 1940), Guy Rolfe (in the dual roles of Baron Sardonicus and Marek Toleslawski), Audrey Dalton (as Baroness Maude Sardonicus; Dalton previously appeared in Jean Negulesco’s “Titanic” in 1953), Lorna Hanson (as Anna), Ronald Lewis (as Sir Robert Cargrave), Vladimir Sokoloff (as Henryk Toleslawski) and Erika Peters (as Elenka Toleslawski). Fellow Svengoolie SvenPals from coast-to-coast will be excited about his upcoming big broadcast premiere of a Columbia Pictures–Hammer Studios horror classic. Original Columbia Pictures/Hammer Studios theatrical trailer for “The Gorgon” (1964). The legendary Berwyn/Chicago-based horror film host will present his big coast-to-coast broadcast premiere of “The Gorgon” (1964), this Sat., Nov. 17 at 8 p.m. Eastern/7 p.m. Central on Me-TV. 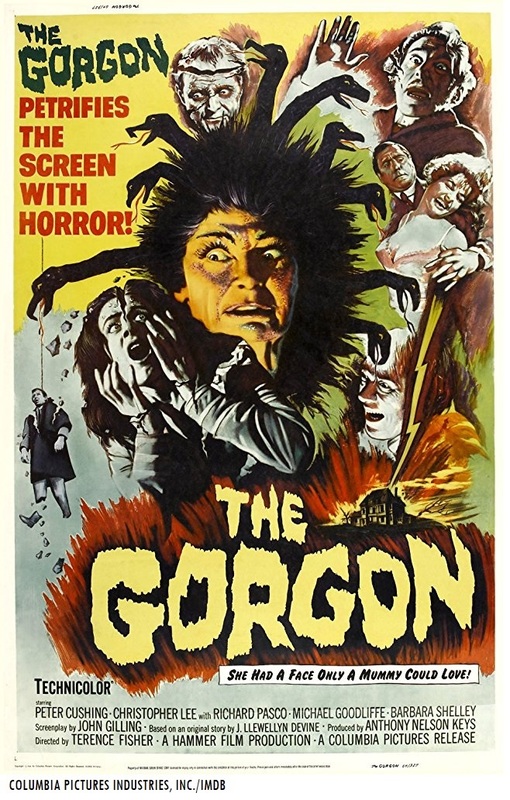 “The Gorgon” was directed by veteran Hammer Studios director Terence Fisher. Some of Fisher’s Hammer productions include “The Curse of Frankenstein” (1957), Horror of Dracula (1958), “The Revenge of Frankenstein” (1958), “The Mummy “ (1959) and “The Two Faces of Dr. Jekyll” (1960). Sven previously aired “The Gorgon” (1964) on his hometown television station in Berwyn/Chicago, WCIU-TV 26/”The U” in Oct. 2008 (according to IMDB). Who was in “The Gorgon” (1964)? The players who appeared in Fisher’s Columbia-Hammer thriller were Christopher Lee (as Prof. Karl Meister), Peter Cushing (as Dr. Namaroff), Prudence Hyman (as the Gorgon), Patrick Troughton (as Inspector Kanof), Barbara Shelley (as Carla Hoffman), Michael Goodliffe (as Professor Jules Heitz), Richard Pasco (as Paul Heitz), Joseph O’Conor (as a coroner), Jack Watson (as Ratoff), Redmond Phillips (as Hans), Alister Williamson (as Janus Cass) and Michael Peake (as the constable). 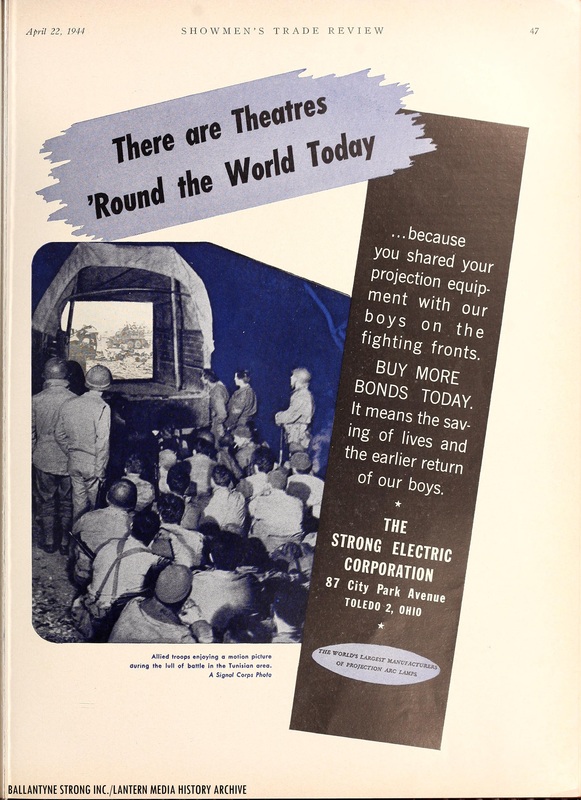 1944 World War II War Bond drive ad from the Strong Electric Corporation (now known as Ballantyne Strong); encouraging exhibitors and theatergoers to purchase War Bonds; along with the use of Strong’s motion picture projection equipment by United States Army troops overseas, photographed by the United States Army Signal Corps. The author of “Silver Screen Reflections” salutes all Armed Forces veterans. Thank you to all of our brave service people everywhere! -C.H.